David Wondrich, in his regrettably out-of-print book Esquire Drinks, has the daiquiri as one of his four pillars of the cocktail world. 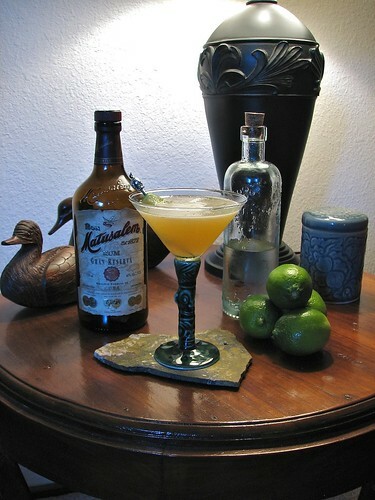 It is a little odd to write about the daiquiri, the essence of simplicity, a couple of years after writing about the more complicated Hemmingway Daiquiri, which contains two citrus juices and an extra screwball liquor. Shake with ice and strain into a chilled cocktail glass. Garnish with a wheel of lime. I did deviate a little from the light rum used in daiquiris, which makes a fine drink. Instead I used an aged rum from the Dominican, and a very pleasant substitution it was. Must remember to thank the inlaws again for that nice little stocking stuffer. Sounds lovely. Simple is often delicious. I completely agree. I think that is in part what makes a cocktail classic. That ability of just a couple of ingredients to come together and spectacularly harmonize. Gestalt as it were. It’s why lumping some of the blender creations under the same name kind of irks me. It’s not that on a hot summer day they aren’t enjoyable, but they just don’t have that simple magic. Cheers.